How is a truss modeled in Advance Design? The problem of correctly modeling a truss implies two aspects: geometrical composition and static scheme. In the following examples different ways of creating a truss will be presented. An automatic portal frame / trusses generator is available in Advance Design. It can generate automatically transverse frames or trusses for industrial steel buildings (warehouses). 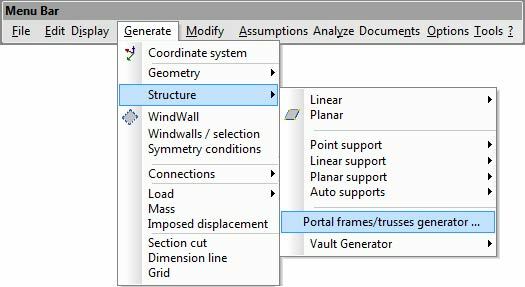 This function can be accessed from the "Generate / Structure / Portal frames/trusses generator" menu. In the "Model library" window, the user can select different predefined frames or trusses. The geometrical data of the truss: length of the frame, height, slope angle and the number of purlins for each slope. 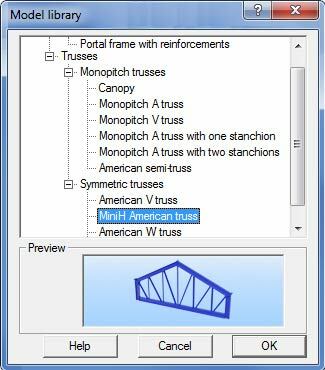 The trusses can also be created in Advance Design by importing lines in DXF format and converting them into linear elements. This method is fast and useful if the user already has the truss geometry from an architectural plan. After the import of the geometry in Advance Design, the lines must be converted into linear elements. Select the imported lines and use the "Convert lines to linear elements" command on the "CAD Modifications" toolbar. The truss can also be created using a more direct approach by manually modeling the truss element by element. After finalizing the geometrical composition the next step is to correctly define the static scheme of the truss. Because the nodes of the truss are articulated, all the elements are only subjected to axial force. The nodes of the truss must be correctly modeled in the manner that rotations are permitted. The following static scheme is recommended: each node of the truss will have at least one element that has all the restraints rigid and the rest of the intersecting elements will have the rotations in the truss's plane free (articulated). This release, rotation in truss's plane (Ry) of the linear elements, is defined in the properties window of each linear element for each end. Note: The number of the element's extremity is always given by the orientation of the local x-x axis (in red).